I have followed Soane‘s products for years, ever since I fell in love with their charming Fireside chair, shown below, in The World of Interiors. Recently I had the pleasure of meeting with Sarah Meeke from Soane, who was kind enough to fill me in on the details of the company and some of their latest projects. Founded in 1997 by Lulu Lytle and Christopher Hodsoll, Soane’s seemingly simple goal is to provide architecturally inspired bespoke furniture and lighting. By combining the superb design and workmanship of antique pieces with the highest quality British craftsmanship and the flexibility of custom furniture, they produce over 350 pieces, all in Britain. Sound great? Well, it is! 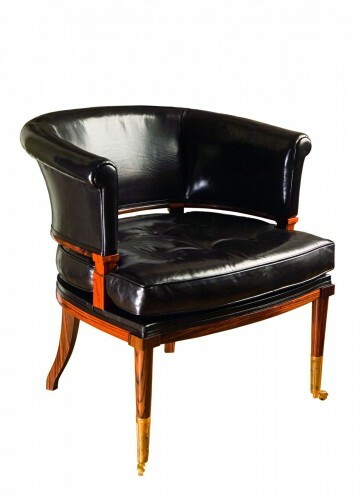 In fact, earlier this month Soane was awarded the 2010 Luxury Craftsmanship Award by Walpole, a non-profit organization for the British luxury industry, which presents these awards to companies for their work in the luxury sector, recognizing outstanding achievements in design, craftsmanship, business and culture. Soane is my kind of firm – a modern company that respects, seeks out and supports artisans with traditional skills and unparallelled workmanship. As much as we have advanced, there is still no substitute for hand made goods and outstanding craftsmanship, resulting in products of excellence in both quality and beauty. It is the attention to details and flexibility in production that sets Soane apart, unlike many other companies, who are more concerned with cost cutting, producing large quantities or working within tight time frames. Soane’s pieces include both interpretations of 18th, 19th and 20th century originals as well as their own collections of furniture, lighting, door handles, glass and silverware. 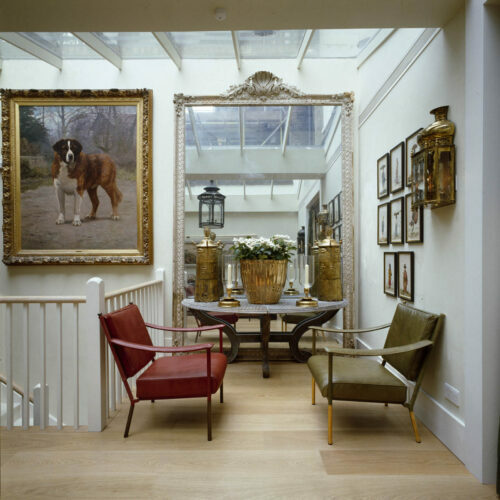 Customers include the world’s top interior designers (including Thierry Despont, Colefax & Fowler, David Collins and David Mlinaric ), style setters from Mick Jagger to David Tang and business leaders including Bill Gates. 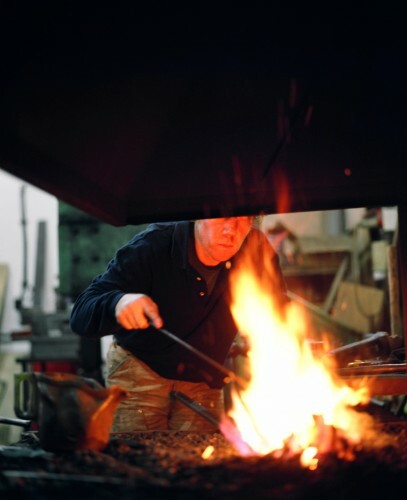 Soane uses a stable of craftsmen who possess skills in such areas as iron forging, saddlery, cabinet-making and bronze casting. 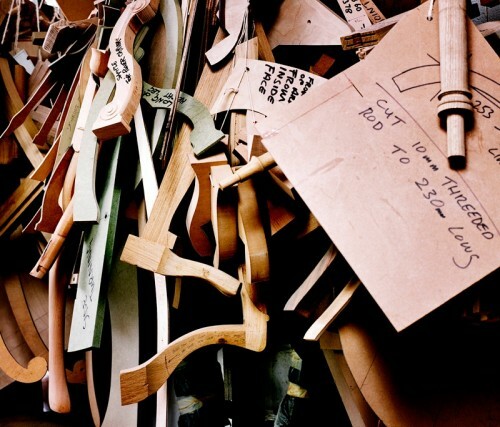 They carry no stock other than showroom models for Soane employs a cottage industry of blacksmiths, silversmiths, upholsterers and saddle makers all over England who make the pieces to order. The blacksmith above, in his workshop in Welsh border country, is working on a piece for Soane. 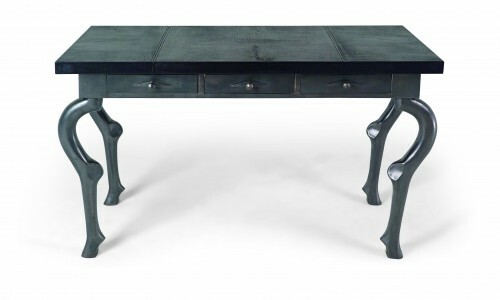 Could it perhaps be the forged hand-beaten wrought iron Peristyle Coffee Table? Or perhaps the charming Stag table? 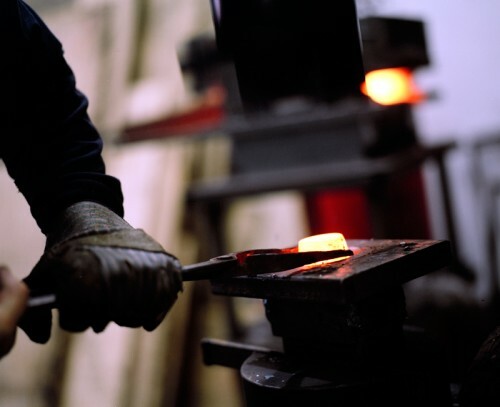 Each leg weighs 50 pounds and the blacksmith has only one opportunity to beat it into shape otherwise the iron loses its strength and its ability to hold up the honed Welsh slate top. 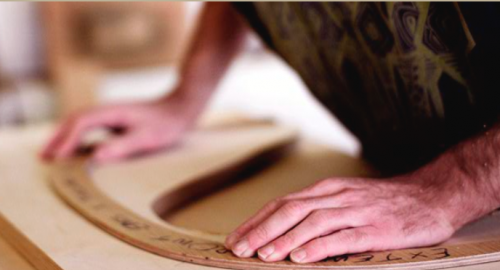 The beautiful Quiver Klismos chair below involves five different craftsmen. First someone painstakingly constructs the frame. After it is hand polished, its brass casters, made and patinated at a forgery, are added. 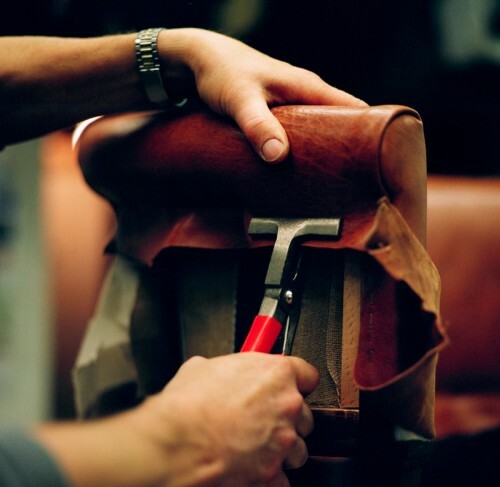 The fourth step is the upholsterer who uses hand-worked leathers that have been traditionally dyed in a small English tannery. Lastly hand-tooled line banding and studs are added to complete the handsome chair which will reside in some lucky person’s library. The elegant Chinoiserie lantern represents the incredible craftsmanship involved in the area of metalworking. The North of England, once a world center for fine metalwork, is now home to only a few workshops, where the apprenticeship system is still in place, using the same Victorian machines that were used at the height of Britain’s industrial prowess. First, sheets of rolled copper are hand-cut. These are then beaten, soldered, color-treated and polished. 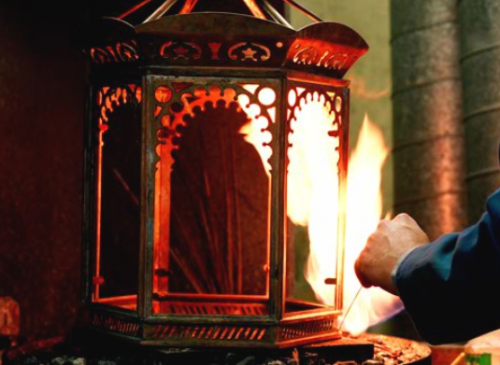 Each Lantern is step by step individually hand crafted. There is no production line and nothing is ever mass produced. Soane’s products are distinctive in design and can be further customized to create a totally unique product. I would be delighted to have any of these in my home – here are a few on my wish list. 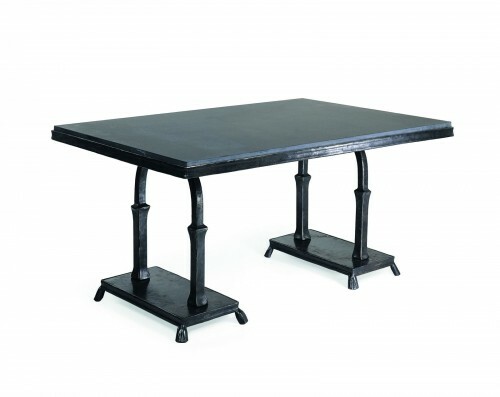 This large Halma Man table is made of cast resin and can not only be painted in any color or finish but can be left outdoors. I’m rather partial to this duck egg blue. How fabulous is this folding card table?! A little different than the one hiding for emergencies in the back of my coat closet. 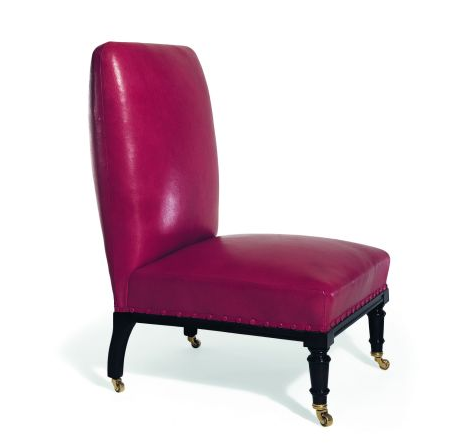 Available in brass, polished nickel, antique bronze, dark bronze, antiqued silver and antiqued gilt finishes, it can be covered with a client’s own fabric or hand stitched four-panel goatskin leather tops. 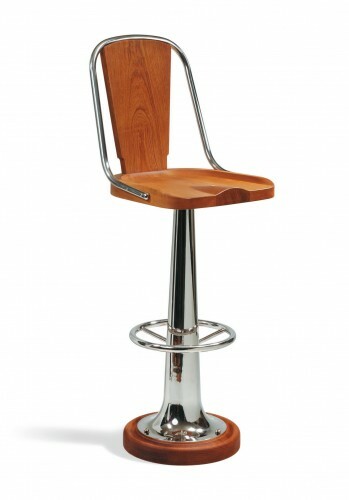 These Yacht Bar Stools would have been splendid at my raised mahogany counter in my old kitchen. Available in mahogany, oak, walnut, painted or lacquered beech as well as natural rosewood they come with brass, nickel-plated or antiqued bronze pedestal and back rail. 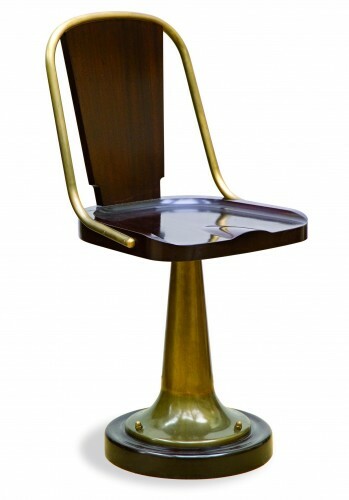 I personally prefer the brass as shown below in the chair version. And for those lucky customers ordering them for nautical use, all Soane’s yacht furniture is available in teak or iroko with metalwork in stainless steel 316. (good to know). I could easily pick ten more products to show, but I’ll let you peruse the site for yourself. Tomorrow we’ll take a look at another aspect of Soane’s amazing repertoire. This entry posted in furniture, lighting, outdoor furniture. Entry Tags: Handcrafted Furniture, Luly Lytle, Soane Bookmark the permalink. How simply gorgeous – each piece is swoon-worthy in it’s own right. I love how Soane only has the showroom samples (sounds familiar!) and makes everything to order. In this day of mass manufacturing, it’s nice to know you can have something made especially for you. I’m so glad to have been introduced to this company and am off to look at more beautiful things! Hope you had a wonderful Thanksgiving! Hi Buzz – yes, this should be right up your alley. Thanksgiving was lovely – hope yours was as well. hmmm, weird, but my first comment seems to have vanished…anyway, was saying that I am new to this line of furniture and now completely smitten! Each piece is amazing and that resin table needs to be mine! Zhush – this happens to me sometimes too – frustrating! But I love that resin table as well – in exactly that color! Hi Elle – I know, everything is so beautiful!! Thanks for highlighting Soane and the fine furniture craftsmanship that goes into all of their work and which is also present in antique and vintage furniture of quality. That why buying old quality items is such a great option. Of course, I’m a little biased, but quality of workmanship by in-country artisans always stands several cuts above and never looses value. All of those chairs are amazing. Hi Mary – yes quality always stands the test of time – all of their designs are amazing!! The Pompadour Day Bed is love at first sight! What a fantastic company, the amazing beauty of each of these pieces is enhanced by the knowledge that it was made with so much skill and care. I have a feeling I will spend many hours daydreaming while browsing the Soane site! HHGGG – Isn’t everything just amazing??!! You’ll be drooling when you go the site! Hi kate – yes the chinoiserie lamp is amazing- and there are many other gorgeous ones as well! I love that daybed and card table! Hi Connie – me too!!! Gorgeous pieces. Beautifully made. My kind of company…..now, if they don’t mind dropping off a few of those lovelies, I know I could give them a good home! PPT – too funny – I’m sure you would be the best of caretakers! Oh, my! I am sorry my ignorance, but I didn’t know about this company and I am so glad I came to your blog today. I am really, really impressed by their products and by your post. Great info! 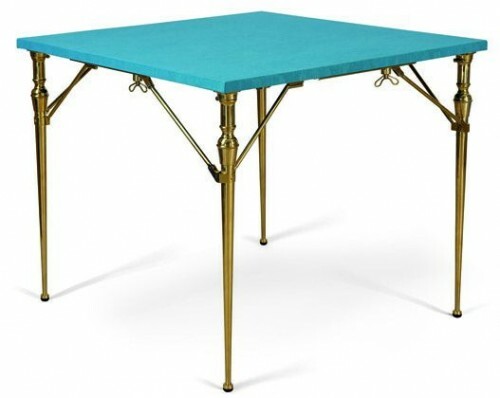 I love the Halma Man table, maybe because I loved that color, maybe because it’s a classic design and that color adds some fun to it. Just perfect! Hi Luciane – So glad you enjoyed learning about Soane – they are really a special firm. Hope to see you soon – chez moi or toi! Oh, I completely agree with you. That Halma Man table is just gorgeous. Lovely blue! I also adore that Chinoiserie lantern…That showroom looks like a place you could linger for hours. It’s wonderful to hear that a company still cares about quality! HH – They are obsessed with quality and that’s why people like you and I love them. Wait til you see their professional range tomorrow! Thanks so much for stopping by Town and Country Mom. I am so happy to have found your blog; I have a lot of catching up to do! T&C – Happy to have you visit – feel free to look around. You’re welcome back any time. Thank you for your kind comment earlier today! And I am so happy to have found your site this way! So beautiful and insightful. I enjoyed reading about the Swiss, the Bad boy of Bordeaux (? ), the lovely selection of Thanksgiving table tops and the amazing work of Soane. 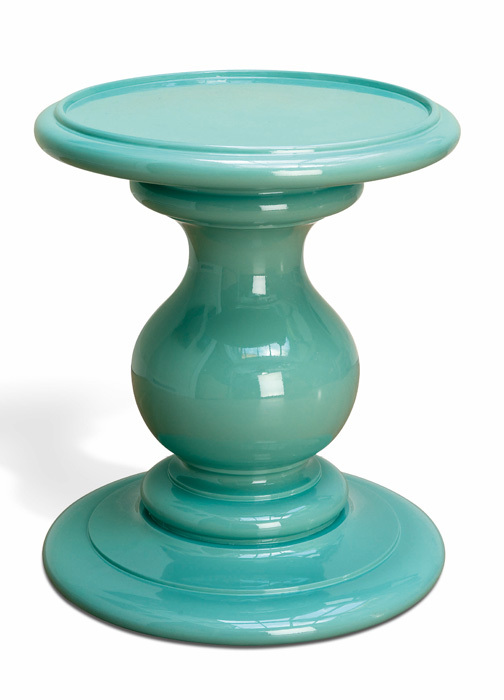 I had seen the small turquoise side table before, but all else is new to me. What amazing craftsmanship! Hi Victoria – Welcome! So glad you have enjoyed wandering around. I hope to see you again soon! 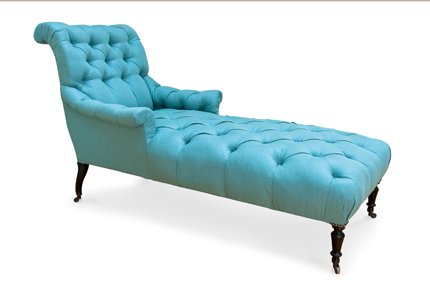 Oh how I adore that Pompadour Day Bed! It is perfection! Hi Signe – I know it’s it fabulous?! Thanks for stopping by. I want the lantern! How do I get a price list? It is the most beautiful furniture in the world. Thanks for the great post, as usual. Maybe next time I’m in the city, we could rendezvous. My Wednesday wine is Barefoot Pinot Grigio. It is dirt cheap and delicious. 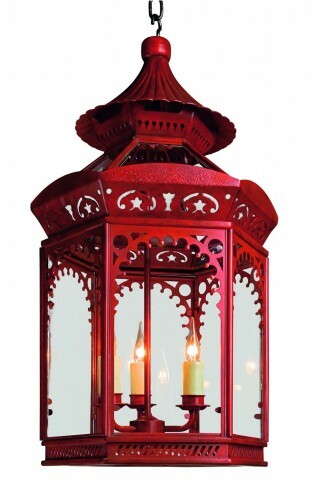 Hi Liz – The lantern is magnificent – and you can have any color, metal etc. Just go to Soane site and request catalogue – tell them I sent you! They are lovely. I’ll have to try your pick – and would love to get together – just tell me when! I have always LOVED Soane!!!!! Their contract line is FABULOUS!!!! Great post! So glad to find a fellow Soane admirer! Thanks for stopping by! 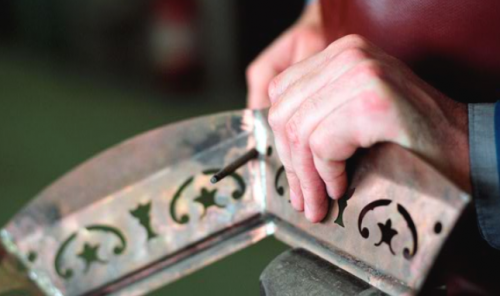 What a lovely informative piece about traditional British craftsmanship and design, tweeted. 81 queries in 0.601 seconds.